As oil prices continue to fall, analysts and producers are trying to wrap their heads around the reasons and identify a floor price. 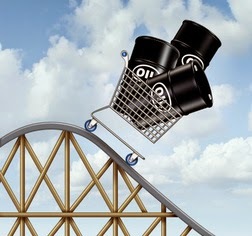 Even though crude benchmarks like Brent and WTI keep dropping, the cost of finding oil continues to rise. What are some of the key drivers that have created this paradox? Because of internal strife, analysts have until recently assumed that Libya’s output would hover around 150,000-250,000 thousand barrels per day. It turns out that Libya has sorted out their disruptions much quicker than anticipated, producing 810,000 barrels per day in September. Libyan officials told the Wall Street Journal last week that they expect to produce a million barrels per day by the end of the month and 1.2 million barrels a day by early next year. European Central Bank president Mario Draghi has left investors concerned about the continent’s slow growth. Germany’s exports were down 5.8 percent in August, stoking the fears of anxious investors that the EU’s largest economy had double dipped into recession last quarter. Across the Eurozone, the IMF again lowered its growth forecast to 0.8 percent in 2014 and 1.3 percent in 2015.